Late on Saturday night, a summit of Southeast Asian leaders in Manila had broken up and its attendees had begun to fly home. But the host of the meeting, Philippine President Rodrigo Duterte, had yet to issue a chairman's statement describing their discussions. Diplomats from the ten Association of Southeast Asian Nations (ASEAN) were locked in difficult negotiations over the statement's language on the South China Sea, with some governments urging the group to hold the line against Chinese construction and militarisation of artificial islands there, and others urging a softer tone. 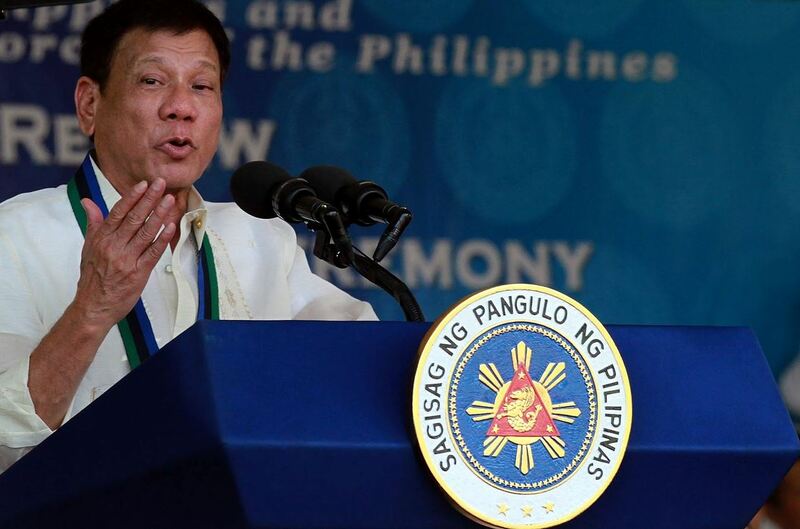 Duterte, who has sought to downplay the disputes in exchange for aid from Beijing, would make the final decision. That is when President Donald Trump called, and in a conversation that the White House described as 'very friendly', endorsed Duterte's brutal drug war, which has left thousands dead in extrajudicial killings over the past ten months, and invited Duterte to the White House. If the offer was meant to provide an incentive for Duterte to take a tougher line with China, it did not work. The statement was a step back from past ASEAN statements on the South China Sea, making no mention of Chinese reclamation or militarisation. On Monday, Duterte coolly told reporters that he did not know if he would even be able to make the time to take Trump up on his invitation. A few words in a communique will soon be forgotten. Far more worrisome is the message that Trump's coziness with Duterte, and sympathetic words for other strongmen around the world, sends to a region that before Trump took office had already been moving in an illiberal direction. Duterte’s bloody drug war is only the most distressing example. For the last 30 years, the US has played an important role in pressuring Southeast Asian governments not to abuse human rights, undo hard-won democratic reforms, or take other illiberal measures. In cases such as Indonesia and Myanmar, the pressure helped bring about profound changes; in Vietnam and Malaysia, it has helped to limit repression. But under Trump, the pressure is off. In a string of Southeast Asian countries, Trump’s statements and actions have given the green light to illiberal governments to continue or even accelerate repressive measures. The leader of the Thai junta, Prayuth Chan-ocha, also received a call from Trump and invitation to the White House over the weekend. Prayuth took power in a coup three years ago, and has repeatedly put off elections. When they are eventually held, it will be under a new constitution designed to protect the military's influence and prevent supporters of former Prime Minister Thaksin Shinawatra from gaining power. Trump’s concession of an invitation to the White House will undercut the work of US diplomats who have been encouraging Prayuth to stop detaining dissidents and return Thailand to democracy sooner rather than later. Other governments in Southeast Asia may not have heard from Trump over the weekend, but have been reading illiberal signals out of Washington. In Malaysia, Prime Minister Najib Razak has shut down media outlets and cracked down on dissent since reporters revealed in 2015 that he and his family had misused millions in public funds. The Obama Administration gave succour to Malaysian journalists and anti-corruption advocates when it announced several Justice Department lawsuits seizing the proceeds of that corruption (including royalties from the Hollywood film Wolf of Wall Street) in July of last year. Though President Trump has had no reported contact with Najib since his inauguration, Trump’s hostility toward the press and his political opponents, as well as allegations of self-dealing and nepotism against him, have undercut US moral authority on the issue, and raised questions in the Malaysian capital as to whether Najib’s crackdown will continue to be a hindrance to closer relations with the US. None of this is to suggest that the President should not speak to the leaders of Southeast Asia. The region is too important to ignore – it is America's fourth largest market for trade in goods, and includes several important security partners. Thailand and the Philippines are treaty allies. As Beijing seeks to expand its influence over the region, it is important that the US engage Southeast Asian leaders and seek to work together on common economic and security challenges. That is why President Obama hosted the leaders of all ten Southeast Asian nations in California (though not the White House) last year. But it is critical that, just as his predecessors did, Trump raise issues of democracy, human rights, and good governance with his counterparts in Southeast Asia when he speaks to them. He can start by delivering that message when he attends the annual East Asia Summit, to be chaired by Duterte in Manila in November. He should also allow his invitations to Duterte and Prayuth to lapse. Though Duterte and Prayuth lead US-allied nations, invitations to the White House that legitimise their increasingly repressive rule are beneath the dignity of the American presidency. Photo by Flickr user Prachatai.